Two models are in the making. Model-S features a width between 78 and 100 cm and has a maximum speed of 24 km/hr. Model-M features a width between 100 and 140 cm and a maximum speed of 44 km/hr. It also has heavier (Lithium-Ion) batteries and more powerful motors allowing it to carry up to 300 kg. Both vehicles have a a range that allows a full day driving (about 200 km on a flat terrain). What sets the KURT vehicle really apart from other vehicles is its complete modularity. The vehicle is composed of a self-propelling platform, itself composed of four identical propulsion units consisting of a wheel with its motor and suspension, a battery and all its controlling electronics. The whole vehicle train is steered by a control algorithm that steers the vehicle as a whole by “coordinating” the traction on all the wheels. As each wheel adds propulsion power as well as steering capability, the resulting system is fault tolerant but also adds range capacity when the load increases. As a side-effect, the propulsion is fault tolerant and very manoeuverable. High strength aluminum also results in a robust structure that reduces the production cost at low volumes and yet achieves a lower empty weight. On top of the standardised self-propelling platform sits the super structure that can be customised for each application. Based on market feedback, it was found that specific configurations can be designed in a single day. Offerings include single person vehicles with an optional cargo; four person vehicles as well as cargo only containers. Variants allow to transport pallets as well people on lowered platforms. The superstructure can be detached during stops and swapped for another one (e.g. 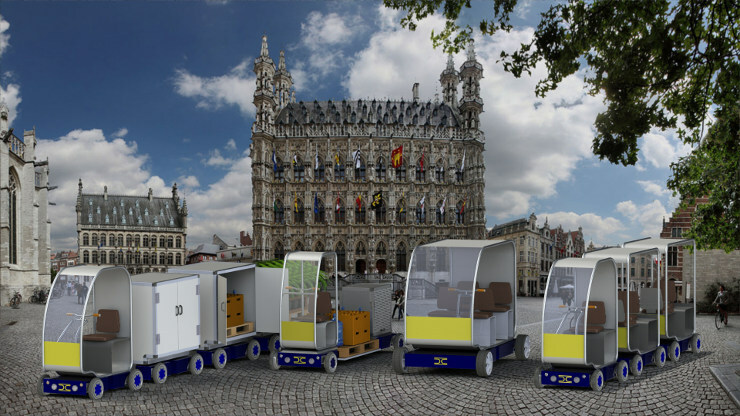 for moving people in the morning and parcels during the day). Another novelty is that vehicles can be assembled like a train whereby each vehicle can add power and battery capacity (hence more range or a higher load capacity). The KURT vehicle, even while designed as a light weight vehicle for urban mobility, features many disruptive novelties that even open road vehicles don't have yet. The four controllers cooperate in controlling the wheels which allows to control the steering for safety and best performance. Each vehicle is also remotely monitored over a smartphone or tablet. This facilitates fleet management, preventive maintenance and driver supervision. Each vehicle can also be maneuvered from a smartphone, for example to put a container along the road. The latter can also be used to link the vehicle with an authentication token to prevent unauthorised use. The KURT vehicle system solves many issues that hamper electric mobility based on classical vehicle concepts from becoming widespread in urban environments. While electric driving largely eliminates air, noise and heat pollution in cities, it also needs to meet other constraints such as limited space and changing demands. Traditional designs cannot provide this in a flexible way. Whereas the traditional approach requires a mixture of e-bikes, e-scooters, tricycles and vans, the modularity and scalability of the KURT allows to use just one type of vehicle platform in a cost-efficient way. The KURT vehicle is first of all targeted at the professional market operating in urban environments, in-doors as well as out-doors. Our roadmap for an e-mobility platform was defined in 2009! Maybe to the surprise of some, but the KURT e-vehicle development started conceptually some years ago. In 2009 to be precise. At that time it sounded a bit like science-fiction and while the KURT does not yet deliver on all the ideas that were formulated at that time, rereading the roadmap text was an interesting experience. It wasn't such a far fetched idea after all. Essentially, KURT delivers the base vehicle on which we can build to deliver all upcoming auto-driving functionality. One note however. Our base vehicle is not a 2-wheel one. A safety analysis has shown that this is not safe enough. So, we went for 4 wheels, a solution that also is more space-efficient than a 3-wheel one. Read the original article here. Altreonic is a technology driven SME with a focus on trustworthy systems engineering. The company has a history that goes back more than 25 years in demanding domains like aerospace-defense. As such, Altreonic developed its own unified systems engineering methodology, supported by the internally developed GoedelWorks portal and VirtuosoNext Designer programming environment. These play a crucial role in the engineering process of the KURT system and allowed for example to develop all electronics and software using virtual prototyping even before the mechanical components were assembled.